Q. Explain Cell Spacing and Cell Padding? Couple of attributes known as CELLSPACING and CELLPADDING. Both are part of <TABLE>tag. CELLPADDING is the amount of space between border of cell and the contents of the cell. Default value for this attribute is 1. This is so that any text in cells doesn't appear to be sticking to the border. Though, you can specify a value of 0 if you wish. CELLSPACING attribute has a somewhat different meaning. It determines spacing between adjacent cells. Its default value is 2. 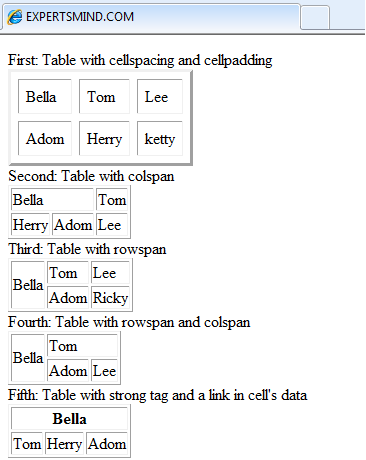 The below illustration displays these and some other significant attributes of <TABLE> tag.